Amanda Swann has written and researched this insightful story from the Stockport Archives. When the schools were taken for use as military hospitals in March and April 1915, it was agreed that the children from the affected schools would be distributed amongst other schools in the area. The Edgeley Council Infants School logbook notes on April 1 1915 of a meeting with the “Chairman of the Primary Education Committee (Mr J Forster, J.P) […] at 4 o’clock on Tues aft next, the 6th instant, at No 2 Committee Room, Town Hall, to consider the best arrangements to be made for instruction of scholars in schools affected by Military Hospital considerations”. As a result of meetings such as this, the affected schools began sharing school premises with remaining schools in the borough, and operating their timetables on what was known as either a two-shift, double-shift or four shift system. The two schools operating on this system would each take a morning and afternoon session, dividing the school day into 4 sessions for 2 schools. The logbooks for Edgeley Council Infants School, who took on pupils from Alexandra Park Juniors School, and St Peter’s School, who took on pupils from Hollywood Park School, record the changed timetables accommodating the altered system, from which they alternated between earlier and later shifts on a term-by-term basis. The transition to sharing the school premises between two different schools seems to have, understandably, initially caused some disruption. As the opening and closing and hours of the schools were extended to accommodate the growing numbers and need for alternating shifts, an effect could be noted on both attendance and progress within the lessons. Just one week after St Peter’s School had switched to a double shift system in order to accommodate Hollywood Park School in the week ending 16 April 1916, the logbook notes that “The under fives do not attend well in the mornings 8.30am being early for them”. A few weeks later, on June 4, the St Peter’s logbook again notes that the “early meeting of school affects attendance greatly”. This on-going disruption and routine sense of change to the school lives of affected pupils continued until September 1919; the significant amounts of injured soldiers needing treatment requiring the continued use of school buildings as hospitals until nearly a year after the conflict ended. The logbooks reveal a sense that this constant changing of attendance times became a routine aspect of school life, presumably lasting for some pupils for the entire duration of their attendance there. Edgeley Council School notes the changing of times every term, for example, throughout 1918 and 1919 as “in accordance with custom”. 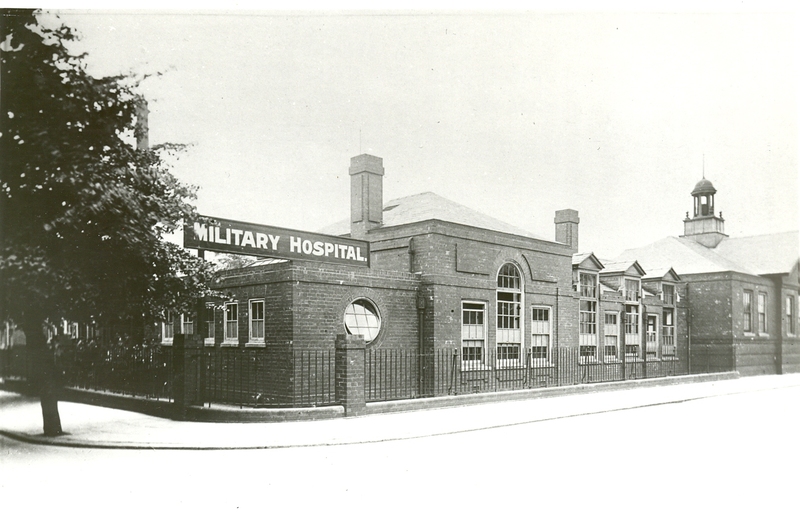 The Stockport Advertiser also reports, in August 1919, of a delay in the return of the school buildings occupied as military hospitals to their original occupants. Whilst the townspeople had no desire to unduly remove the injured who had fought so bravely for their country, the length of time between the discharge of patients and closing of the hospitals seemed excessive. 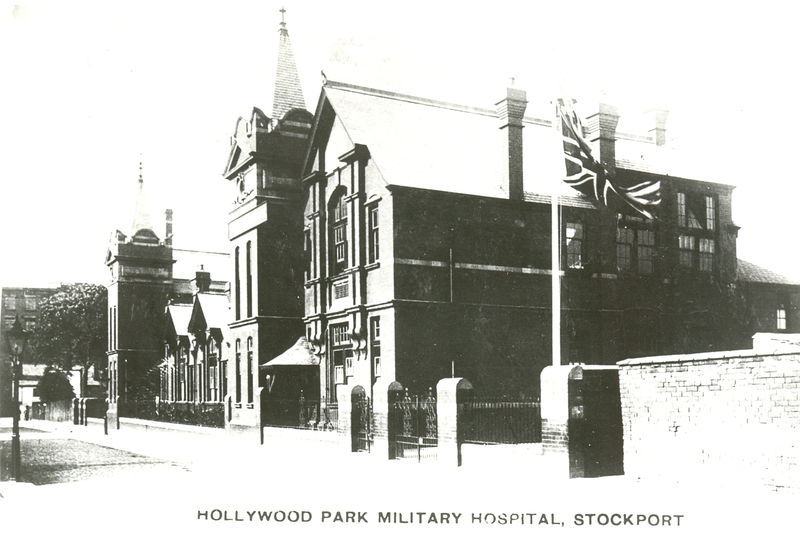 On August 22 1919, an article in the Stockport Advertiser states: “There has been no desire as far as Stockport is concerned to unduly rush the military authorities, but when we know how long the hospitals have been empty of patients, and the delay in removing equipment and handing the schools back to the local education authority, there seems very good cause for complaint.” The buildings are reported as being closed down as hospitals as far back as May of that year and yet still remained unable to allow children to return there for their education at the beginning of the new school year in September. 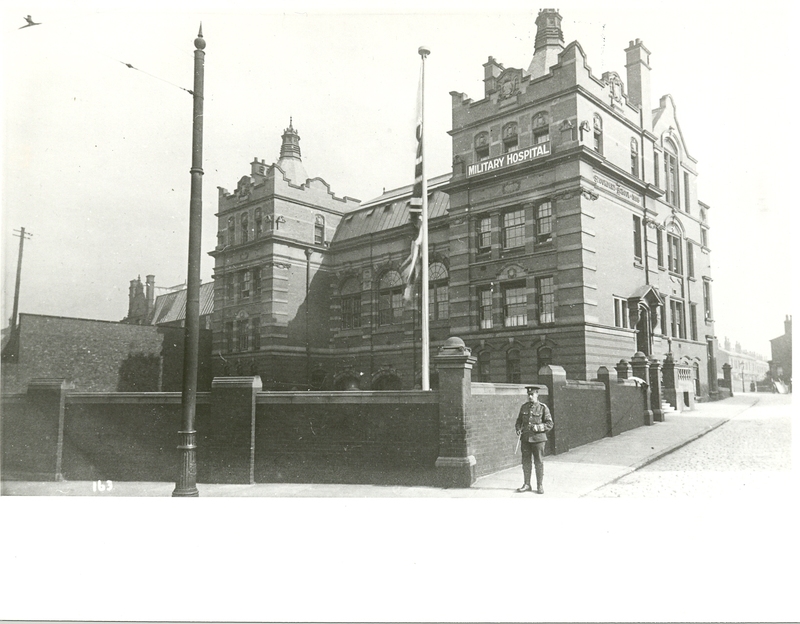 In the words of the reporter: “Stockport was very patriotic in regard to placing its best school buildings at the disposal of the military authorities, and undoubtedly the education of the children suffered through the lack of accommodation caused by the withdrawal of these schools – a regrettable but unavoidable effect – but there should be no excuse for any department withholding buildings from their legitimate purposes a moment longer than is necessary” (Stockport Advertiser, August 22 1919, p. 4). This continued and prolonged disruption must have undoubtedly have impacted upon the lives of those trying to move from the horror of the conflict, serving as an extended reminder of those injured or lost. Another instance of the human nature of the effects of World War I can be found in the appreciation showed by the pupils of Alexandra Park school and their hosts during the war, the Edgeley Council Infants School, during the time the schools were occupied as hospitals. 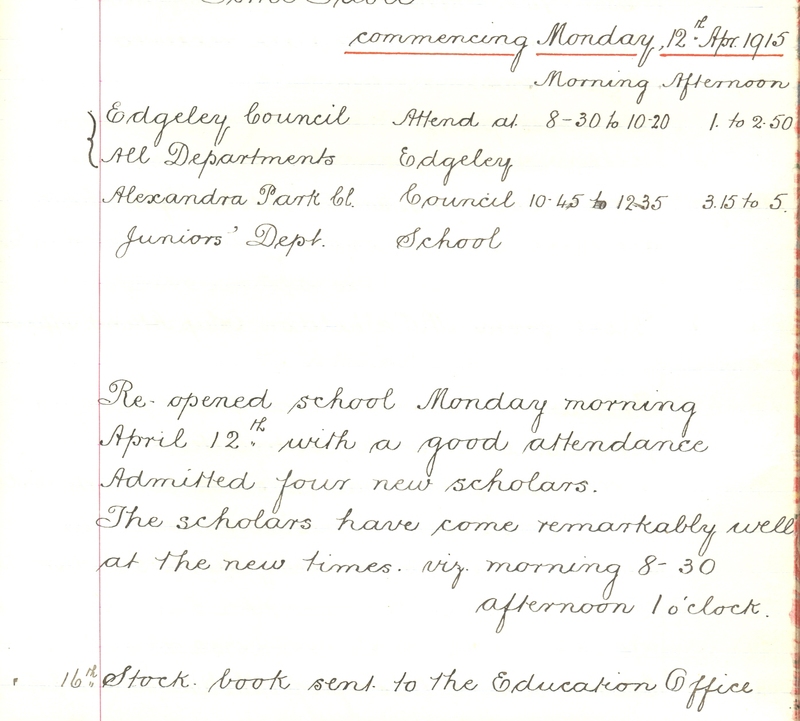 The Edgeley Council school logbook notes on September 12 that “‘Our late guests’, the Alex Park teachers and scholars have returned to their own school. During the whole of the time they were with us, a period of 4 years and 4 months, a true spirit of comradeship was maintained”. Two weeks later, on September 26 1919, the admiration felt towards their ‘late guests’ is reciprocated by Alexandra Park Junior school: “This afternoon we have received from the teachers and scholars of Alex Park Junior School, a beautiful picture. The letter accompanying the picture asks us to accept it as a ‘token of appreciation and kindness shown to them during the time they were our guests 1915-19’”. It is instances such as this that reveal the toll on everyday life the First World War had, away from the trenches, and highlight the extraordinary ways in which war reveals the true benevolence of people to help their community and country. You may be pleased to know that it has been possible to have one of the soldiers who died at Alexandra Park School entered in the Commonwealth War Graves Commission records. He was James H. Clegg originaly from Bugsworth (now Buxworth). He had been a Stockport Policeman and joined the MIlitary Police. Unfortunately he became ill in the trenches and was returned to England. He subsequentally died at Alexandra Park on 19th November 1917. With fellow historians we have been able to have him accepted as a war casualty, As he was employed by Stockport Corporation, on the 100th anniversary of his death, his details will be displayed in a cabinet situated in the main entrance to the Town Hall. That is a really interesting update, thanks very much for sharing it. Maybe you could contribute a blog about the process and James himself? Contact me on : d.lawson@manchester.gov.uk if you’d be interested. 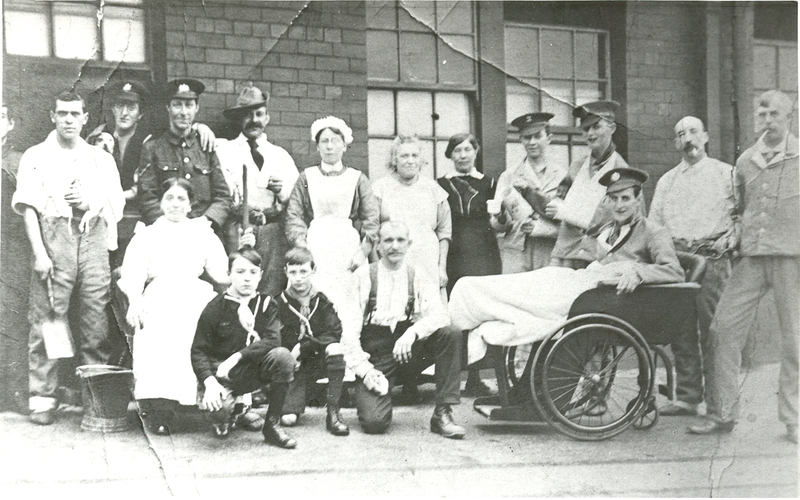 https://www.flickr.com/photos/manchesterarchiveplus/10709549405 Please see this link for more photos of Stockport’s Military Hospital in WW1 – including St George’s which is where my Great Uncle, Pte Arthur Douglas Best, RASC died on 7 March 2015. I’m still trying to find out where he was injured. He was buried in Cathays Cemetery, Cardiff on 12 March with his wife who had already died in 1915. His wife was Alice C Best (nee Harris) who was born in New York, USA of British parents. Her father was a Captain in the British Army but he had died by the time of their marriage in 1899 in Southwark, London. Nice work as ever Terry. Re my entry above (Jonathan P Barker) I’ve stupidly given an incorrect death year – easily spotted perhaps but was double wrong! For the sake of clarity it should be 7th March 1917. Please would the web-editor correct this – many thanks! If anyone has more information about my Gt Uncle I would be very interested! Thank you!